The weather put paid to Glebe Rangers return to league action on Saturday when the referee deemed the Riada Stadium pitch unplayable for the game against Queens. 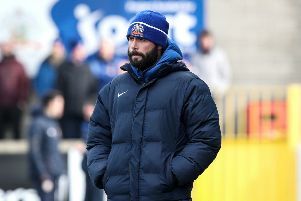 Manager Jason Wilmont and his players were bitterly disappointed the game wasn’t played as they hoped to build on the momentum from last week’s cup game when they disposed of league leaders Limavady United after an impressive performance. This week Glebe travel to Tobermore, a tough enounter for Wilmont and his men however, he will have the services of some of his new signings. “The pitch passed an inspection at 9.30am but it was very heavy. The referee inspected it again about 1.30pm and called it off. The lads all wanted to play buy what can you do. Wilmont has made no bones about the fact he wanted to add numbers to the squad and Adrian McCook has re-joined Glebe from Dervock and Lewis McVicker has also rejoined from Ballybogey FC. The Glebe boss has also secured the services of Luke Carson from Carrick Rangers. “Jake was at Ballymena last year and he trained with us last summer and I thought I was going to get him signed but it didn’t work out and he went to Carrick.